Boston firefighters are paired with the Shriners Hospitals for Children’s young patients to go on field trips that make the kids more comfortable in their own skin. Shriners Hospitals for Children is partnering with local firefighters to empower children with traumatic burns through a program called Team Brave. Boston firefighters are paired with the hospital's young patients to go on field trips that make the kids more comfortable in their own skin. "We do three things. We engage, we encourage, we empower," said Steve Turley, one of the firefighters participating in the program. Through field trips around the city, volunteers like Turley help to reintegrate these children into their communities with activities like yoga, painting, and skating. They hope to make the kids more comfortable with their bodies, knowing that people might stare or become nervous because of their severe injuries. Rebecca Parmenter, a child life specialist and a Team Brave leader for Shriners, said, "It can be really difficult, very emotional. You don’t look the same that you did before, and if you're a school-age kid or a teen you know you’re very self-conscious, and you know worried about how people might see you from the outside." 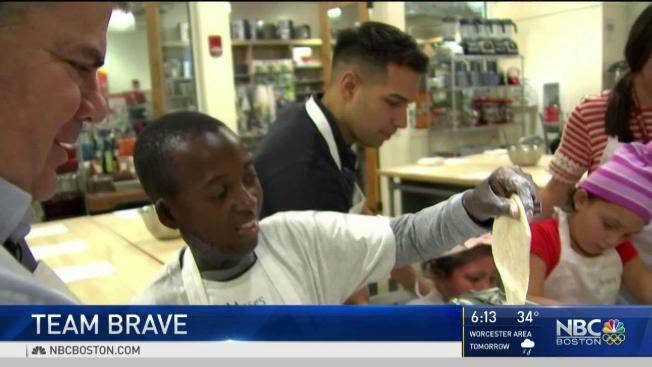 Steve Turley visited a cooking class with 13-year-old Moses during one of his recent visits. The Dorchester firefighter stood behind the soft-spoken Zambian boy and murmured words of encouragement as they made pasta from scratch. "I used to feel shy. I used to wonder what they think of me," Moses said. He was hurt in an accidental fire four years ago. The resulting burn now spreads across his hand, chest, and leg. All he remembers from the accident is pain. Moses came to Shriners for surgeries to help his range of movement and dexterity. During his field trips, firefighters have helped him with yoga poses and cutting pasta to help with his recovery and to prepare him for when he leaves Shriners. "What I personally see is I’ve seen smiles on their faces," Turley said, tears in his eyes. Moses said he’s not scared of going out in public anymore. He is no longer worried what people think of him. "I'm the best," he said. Moses will return home in a few months, but until then he will be finishing treatment at Shriners through Christmas. He is wishing for a PlayStation 4, which he can play now that his hand is healed.